instead of the name Volt assigns it. You’ll need a Volt membership to do this. Notice the “https”? It even takes care of making sure there is a certificate in place, so your site is secure. The app is still served from the Volt server, so all the files and MIME types are in the right place. Here’s how to set this up. Google Drive is a convenient way to store documents in the cloud and access them on any of your devices. It’s also an easy way to share documents. Millions of people use Google Drive – recent statistics show Google Docs to be as much as 5 times more popular than Microsoft Word. The great news is that you can access the data in Google Drive from your AppStudio app. For example, you can read the data in a Google Sheet, modify it, and write it out again. This effectively turns the spreadsheet into a database for your app. Volt makes this possible for everyone to use. To use Google Drive, your app needs to be deployed to a server. For security purposes, you have to give Google Drive the name of the server before it will authorize it to access your files. You can set up your own server for this or simply use Volt. 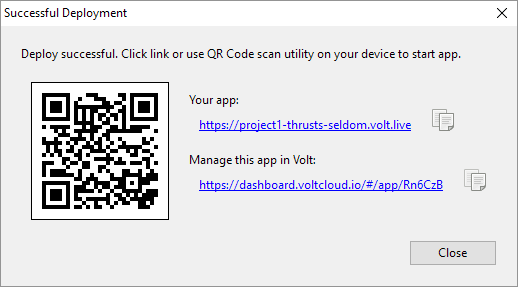 After you deploy your app to Volt, enter the path which Volt gives you (something like “https://googlespreadsheet-signs-smoothly.volt.live”) and update the credentials. If you’ve deployed an app to Volt, you have probably wondered at the odd name your app was given. It takes the actual name of your app and adds a couple of random words to make it unique. That makes sure your ‘project1’ does not get mixed up with someone else’s ‘project1’. Just for fun, it uses a verb and adverb.